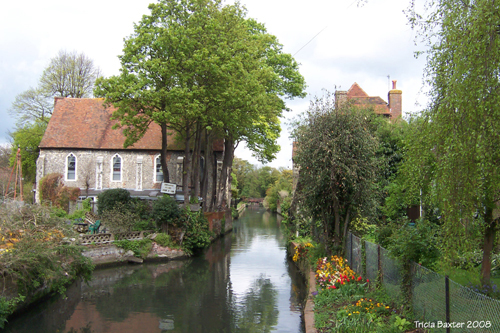 Of the smaller religious houses, the most important remains are those of the Dominicans, or Black Friars, on the banks of the Stour, below St. Peter's Church. This house is said to have been the first they possessed in England. They were established here by Henry III., and the remains are of this date. 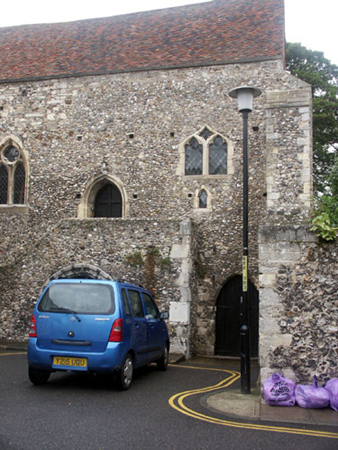 The refectory, with windows high in the wall is perfect, and is now used as a Unitarian Chapel. In it De Foe is said to have frequently preached. 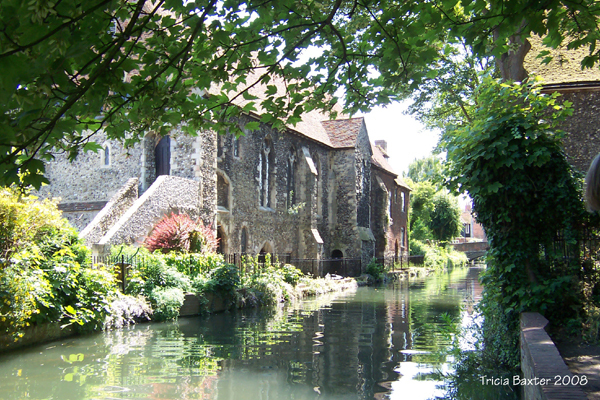 The East window of the ancient church appears on the opposite bank of the Stour. The picturesque view of the ruins may be had from Masters' Nursery, worth a visit for its own sake. The walks are well laid out, and between the trees are pleasant glimpses of the Cathedral and the city wall with its watch turrets. Remark especially an enormous Lombardy poplar planted 1758. "Looking south-west from the Blackfriars"
"In 1658 the Black friars was owned by Peter de la Pierre, a Huguenot surgeon, and was used by the Baptists as a place of worship. 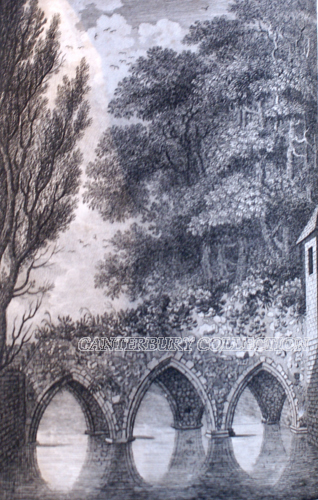 In 1732 the Baptists bought the property and the cloister garth which they converted into a cemetery." 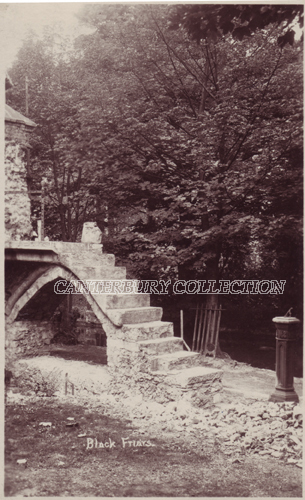 Written on the back of the card is "Christmas Greetings from Canterbury 1927, Albert Coole, Official Guide, 48, Whitstable Road, Canterbury, Kent"
"The family of De la Pierre, or Peters, was originally of Flanders. 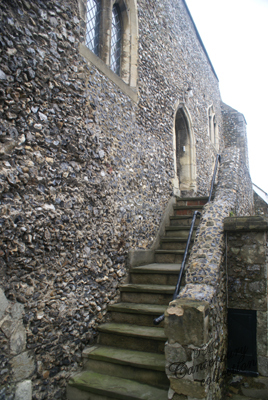 The first of of them who came into England to reside, was Peter Peters, alias De la Pierre, who two years before the restoration purchased the Blackfriars, in Canterbury, where he and his descendants afterwards resided, and practised as physicians with much reputation there, they bore for their arms, Or, three roses, gules." "A Dominican Friary, founded in 1221, by King Hen. III. ; granted, 2 Elizabeth, to Thomas Wiseman, and then to John Harrington." 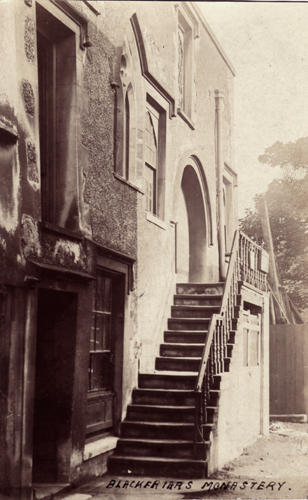 "The convent of this brotherhood was situated on the north side of St. Peter's street; it was approached by three gates, of which the principal in St. Peter's street was beautifully built of squared flint, ornamented with carved stone-work, and over the middle was a niche with their patron saint; this gate was taken down about fifty years ago. On Wednesday, August 3, the forty-seventh anniversary of this Society was celebrated in the Blackfriars' chapel, Canterbury. 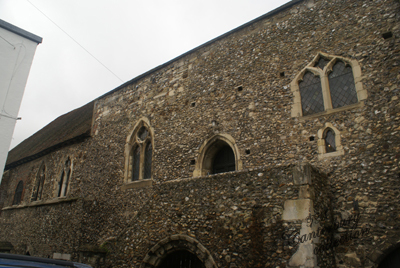 The interest of the meeting was considerably heightened by the venerable building in which it was held, which once formed a part of the possessions of a priory of Dominicans located in St. Alphage's parish. 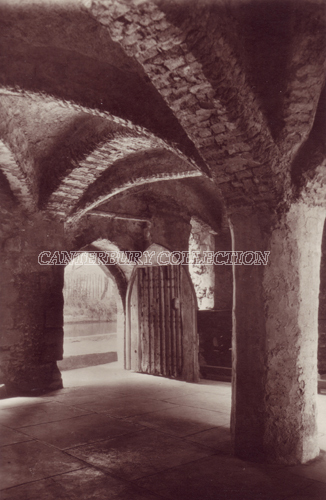 This brotherhood appears to have obtained a footing here about the year 1221, under the patronage of Henry III., who is reported to have built for the order a monastery on the banks of the Stour, on land granted by Archbishop Langdon. 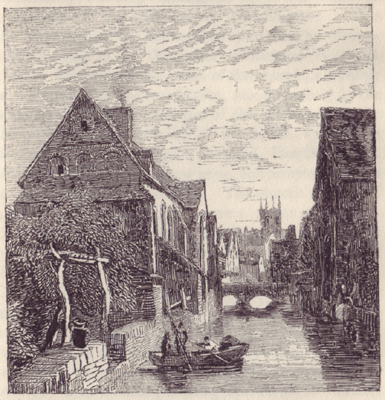 Of the various additions which from time to time were made to the original institution, there remain only the building, formerly the refectory of the monks, which has been long used as a General Baptist (Unitarian) meeting-house, and the edifice on the opposite side of the river, heretofore their dormitory, but now converted into dwellings. At the dissolution of the monasteries, temp. 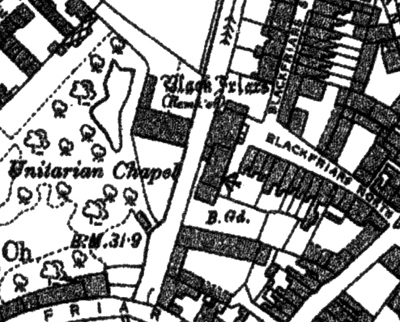 Henry VIII., the property of the Blackfriars was vested in the Crown; and after many changes, we find it, in 1688, in the possession of Peter Peters, M.D., from whom in all probability the portion forming the present General Baptist chapel and burialground was purchased. 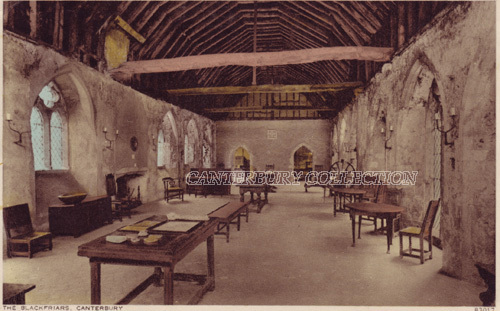 The transfer of the refectory of the Dominican monks to the Baptists appears to have taken place about this period (1688); since we learn from a MS. book of Priscilla Taverner, in the possession of the late Mrs. Pierce, of Dover, that she "was married, April 22, 1691, at Canterbury, at the Friars, to James Redding, by Mr. Hobbs, pastor of the Dover Church." If we may suppose disembodied spirits cognizant of what is passing on earth, the souls of the former occupants of the Friars must have witnessed with no ordinary degree of complacency the gathering of Unitarian Nonconformists in the ancient dining-hall of the Dominican fraternity on the 3rd ult. Preaching friars as they were , whose special function was the instruction and conversion of the unenlightened and the preservation of the gospel faith in unadulterated purity, they must have heard with unmeasured satisfaction the eloquent exposition and illustration of the simple truths and principles of Christianity supplied by the Rev. R. B. Aspland, from the words in Acts x. 24, 25. Nor can we imagine that their gratification would sustain any diminution by contrast of the large and tolerant spirit characterizing Mr. A. 's discourse, with the persecuting means once favoured by themselves as members of a brotherhood famous and infamous for its missionary administration of these "terrors of the Lord" which are familiar to the practice of the Inquisition. Doubtless in the spiritual condition which we picture, freed from the films that obscured their earthly vision, and seeing no longer as through a glass darkly, a comparison of the spectacle presented at the celebration of the forty-seventh anniversary of the Kent and Sussex Unitarian Christian Association, with the sanguinary scenes and methods of which they had once been instigators and instruments, would furnish them with abundant cause to rejoice that the strong man armed had spoiled their inheritance swept and garnished their house, installed in the place of their habitation a better spirit, and rendered its last state superior to the first. Forsaking fancy, however, and keeping to the region of sober fact, it may be alleged that everything contributed to make the forty-seventh annual meeting of the Kent and Sussex Unitarian Christian Association a most agreeable and successful re-union. The interesting historical associations belonging to the place of meeting, the brilliant weather that marked the day, the numerous and respectable company gathered within the chapel, the appropriate character of the services, their introduction by the Rev. 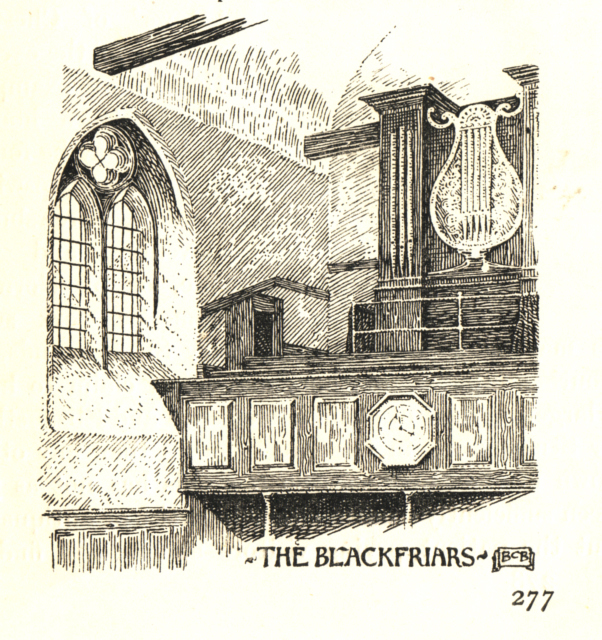 R. E. B. Maclellan, many years minister of the congregation assembling at the Friars, - all these circumstances favoured the occasion and conspired to render it one of good auguary and full of pleasant reminiscence for the future. 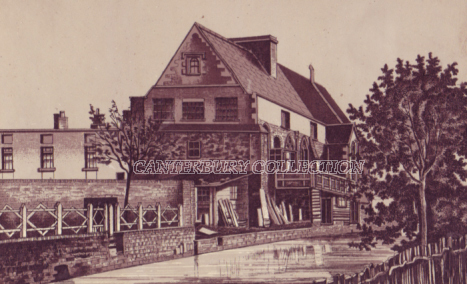 From the chapel a large proportion of the audience adjourned to the Fountain Hotel, where, to the number of between 60 and 70 ladies and gentlemen, they partook together of a substantial dinner, under the presidency of the Rev. W. Smith, Mr. John Brent occupying the vice-chair. After the cloth was drawn, the Chairman, in a few introductory observations , proposed the health of "Our Sovereign Lady, the Queen," which was duly acknowledged, the choir of the Friar's chapel singing a part of the National Anthem, and the company heartily joining in the strain. The Chairman next gave, "Civil and Religious Liberty all the World Over." As usual, this toast was enthusiastically received. Mr. John Brent, the Vice-chairman, responded to it in terms befitting its importance. In doing so, he drew attention to the progress that had been mad during the last quarter of a century in extending the are of freedom, and to the impediments that still existed to individual and social independence, deriving from each an argument for increased zeal, vigilance and action in the same direction. He then eloquently denounced the encroachments upon civil and religious liberty by continental states; expressed his hearty sympathy with the aspirations and efforts of Italian patriotism; and warned the assembly how the hops and aims of the enslaved in every region of the globe centered in England, as the home of freedom, the advocate of the down-trodden, and the general refuge of the oppressed.....etc. etc. 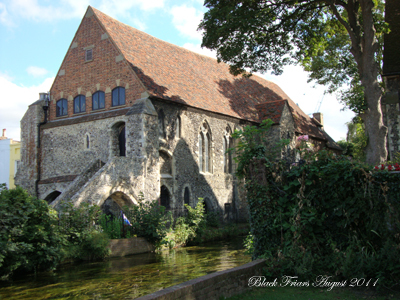 "The Priory of Dominicans, or Black Friars, in St. Alphage parish, was founded soon after the year 1221, by Henry III., who is said to have built this Fraternity a Monastery on the banks of the Stour, on land given them by Archbishop Leighton. Scarcely any of these venerable ruins remain, except the chapel and adjoining premises, and the buildings on the opposite side of the river. 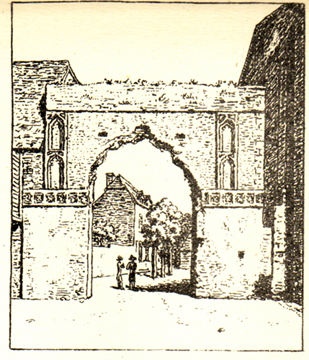 The south gateway, built not long before the 30th Edward III., and faced with black flints, was pulled down some years since. The bridge with gothic arches has been destroyed within our own time, to make way for an unsightly but more convenient substitute. The Priory originally formed a square, which enclosed the burying ground; in this cemetery were buried some eminent persons. 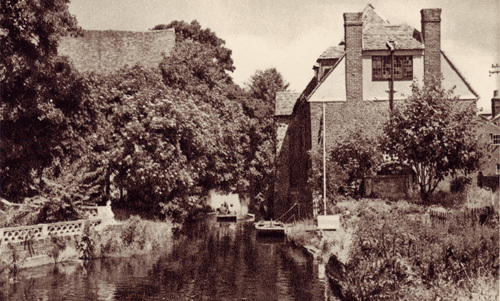 The friars possessed land on the other side of the river, down towards Abbot's Mill, and westward towards Saint Peter's; here they held orchards and pleasant gardens. The Monastery had two other gates or passages besides the one described above, one in the street near St. Alphage church, and the other in Best Lane, near the water-lock, opposite the "Prince of Orange" Lane, near the Rush Market; this passage led directly to their church. 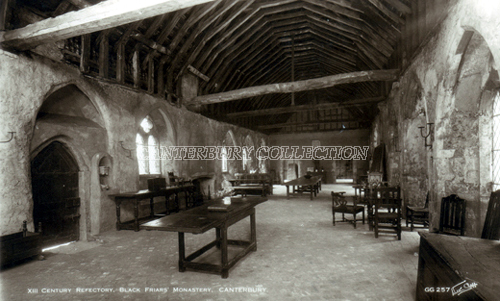 The chapel now belonging to the "General Baptists" was the original hall or refectory of the monks. John Wenar appears to have been the last Prior; for on 25th Henry VIII., 6th of February, five years before the dissolution, he grants to Richard Purchard in a lease for adjoining their house. The original surrender of the Priory into the hands of Henry VIII. is lost or destroyed, as it was not in existence in the records when Dugdale prepared his work on the monasteries. The arms of the house were azure on a cross argent, between four mitres labelled Or, a text Or, surmounted by the letter S. sable. 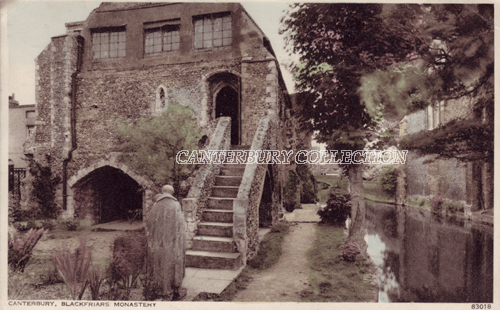 The Monastery, with cemetery, gardens, orchards, &c, was (27 Henry VIII.) surrendered to the King, who granted it to Thomas Wiseman, who sublet it, for a time apparently. John Harrington held it, temp. Elizabeth, from whom it passed to Dr. Peters, who was the grandfather of Mrs. Barrett, second wife of Thomas Barrett, of Lee Priory, near Canterbury, and mother of Mrs. Birch, who subsequently owned it and brought it to her husband, the Rev. Mr. Birch. First. That they would overthrow the pentices, windows and mill belonging to the Monks. Secondly. That no citizen should dwell in any house belonging to the monks. Thirdly. That all rents belonging to the monks should be gathered to the use of the citizens. Fourthly. That no man should send or sell to the monks any victual. Fifthly. That they should seize all the horses and beasts that come into the city with carriage to the monks. Sixthly. That all such monks as came forth of their house should be despoiled of their garments. Seventhly. That a trench should be cast to stop all men from going in or coming out. Eighthly. That every pilgrim should, at his entering, swear he would make no offering. Also. That every one of these commons aforesaid, should wear on their finger a ring of gold, which belonged to Thomas Becket." 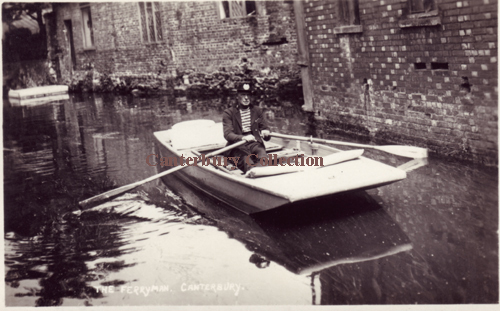 The whole extent of the ground was five acres and seven perches, including the churchyard, Draiton's house and orchard, the island now scarcely to be recognised as an island the dormitory just below it, and the refectory, now used as a chapel. 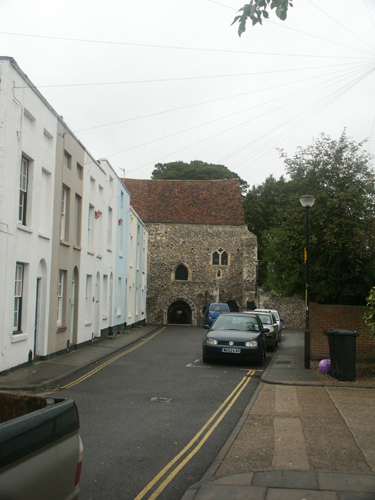 On the south side of the convent existed the cemetery adjoining the chapel. 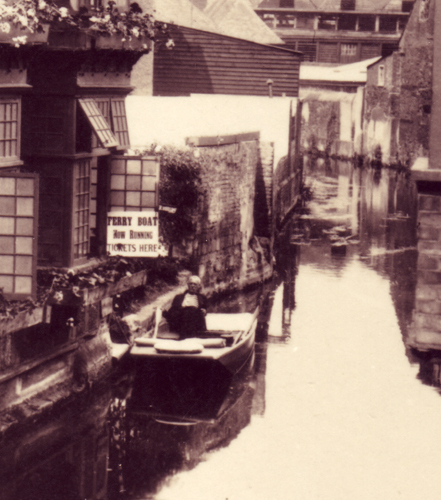 Six curious and picturesque arches once stood across the river, forming a bridge connecting the buildings on either side. "A little farther is another turning into this friery, where the Anabaptists have a burying place and a meeting house, the western walls of which, toward the river, have much the appearance of an old chapel; a wooden bridge here, crossig the river, gives a view of them on one hand, and on the other, of some old Gothic arches, supported by pillars in the river, over which was once a pretty spacious building, perhaps a kitchen or some other convenient office." By a grant of Edward III. 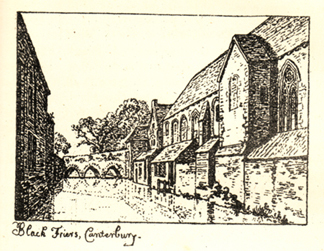 A.D. 1355, the Friars were permitted to enlarge their house. The island had previously been granted them by the same monarch. 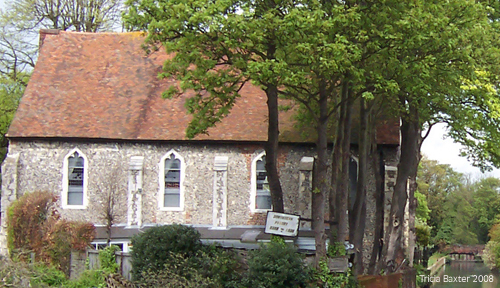 The Black Friars was being used by the First Church of Christ Scientist, Canterbury in the late 1970's.